1971-05-01. New. Ships with Tracking Number! INTERNATIONAL WORLDWIDE Shipping available. Buy with confidence, excellent customer service! 1971-05-01. Good. Ships with Tracking Number! INTERNATIONAL WORLDWIDE Shipping available. May not contain Access Codes or Supplements. May be ex-library. Shipping & Handling by region. Buy with confidence, excellent customer service! Iowa State University Press. Hardcover. 0813803950 New Condition. . New. Iowa State Pr. PAPERBACK. 0813801834 New Condition. . New. Iowa State Press, 1986-09-01. Paperback. Used:Good. Ames, Iowa 50010: Iowa State University Press, 1971. 1st Edition. Hardcover. As New/Fine. Type: Book Stated First Edition/1st Printing/191 Pages. Stated On dustjacket "Family Bookshelf Edition 7212". Dustjacket has light shelfwear. There is a prior bookseller's pricing information on the upper right hand corner of the front endpaper. There is a date on the dedication page, upper right corner. Ames, Iowa 50010: Iowa State University Press, 1971. 1st Edition. Hardcover. As New/Very Good-Near Fine. Type: Book Stated First Edition/1st Printing/191 Pages. Stated On dustjacket "Family Bookshelf Edition 7212". Dustjacket has light shelfwear. There is a prior bookseller's pricing information on the upper right hand corner of the front endpaper. Iowa State University Press, 1971-01-01. Hardcover. Used:Good. Ames, IA: Iowa State University Press, . First Edition. First? Printing. fair, fair. 24 cm, 191, illus., DJ worn, minor warping to some pages, edges soiled. Dr. Edwin D. Frear set out in 1892 to brave the hardships, struggles, and challenges that characterized the life and practice of the country doctor. The author accompanied him on his medical calls in northwest Iowa. Ames: Iowa State University Press. VG/G+. 1971. First Edition. Hardcover. Grey-blue hardcover with blue titles in very good or better condition. Pictorial DJ has some minor fading and shelf wear. Interior is clean and bright. ; 8vo; 191 pages; Growing up in the plains of Iowa. .
Iowa State Pr. PAPERBACK. 0813801834 Like New Condition. . Fine. Iowa State University Press. Hardcover. 0813803950 Like New Condition. . Fine. Ames: Iowa State University Press, 1971. In a Mylar cover. Out of print.. First Edition. Cloth. Fine/Near Fine. Illus. by Photographs. 8vo. Ames: Iowa State University Press, 1971. 1st Edition. x, 191p., b/w illus., dj. A study of the Iowan medical doctor Edwin D. Frear, written by his daughter. Iowa State Press, 1920. Paperback. Good. Ames: Iowa University Press. Very Good in Very Good dust jacket. 1971. first edition ?. Hardcover. 0813803950 . Near very good in like DJ. Very minor wear. Name and date FEP. .
Ames: Iowa State University Press, 1971. FIRST PRINTING of the First Edition (stated). The true story of a young doctor and his wife pioneering a home and a living in Iowa at the turn of the twentieth-century, enduring the extreme weather of the prairie, floods, quarantines, prairie fires, reflecting much on the life and people of the period, the mores and customs, much more. Hardcover with dust jacket, contains illustrations, 191pp., d.j. shows light edgewear to top of spine. A nice copy, the jacket neatly encased in an acid-free archival plastic protector.. First Edition (stated). Hard Cover. Near New/Very Good+. 8vo - over 7¾" - 9¾" tall. Ames, Iowa: Iowa State Univ. Press, 1971. Hardcover. Good/Good. First edition. Good in good dustwrapper. Corners are bumped, small piece torn from the top of dustwrapper's spine, few small stains on the back of dustwrapper, 1 and 1/2inch tears, dustwrapper is price-clipped. Please Note: This book has been transferred to Between the Covers from another database and might not be described to our usual standards. Please inquire for more detailed condition information. Ames: Iowa State University Press, 1971. FIRST PRINTING of the First Edition (stated). The true story of a young doctor and his wife pioneering a home and a living in Iowa at the turn of the twentieth-century, enduring the extreme weather of the prairie, floods, quarantines, prairie fires, reflecting much on the life and people of the period, the mores and customs, much more. Hardcover with dust jacket, contains illustrations, 191pp., d.j. shows light edgewear to top of spine. A nice copy, the jacket neatly encased in an acid-free archival plastic protector.. First Edition (stated). Hard Cover. Near New/Near Fine. 8vo - over 7¾" - 9¾" tall. Iowa: Iowa State Univ. Press. Very Good- in Good dust jacket. 1971. First Edition. Hardcover. In mylar ex lib; 8 vo; 191 pages pages. .
Ames, Iowa: Iowa State University Press, 1971. Very Good + in hardcover in Very Good + dustjacket. 23 by 16 cm. 191 pages. Pictorial dustjacket. Contains some black and white illustrations from photographs. Closed edge tear to top of dustjacket. Book plate of former owner on front free blank endpaper. Bright, clean..
Ames, IA: The Iowa State University Press. Very Good+ in Good+ dust jacket. 1971. First Edition; First Printing. Hardcover. 0813803950 . First edition/first printing in Very Good+ condition with inscription on the front free end paper in Good+ dust-jacket with chipping and several small closed tears; . Iowa State University Press, 1971-01-01. Hardcover. Very Good. Ames, Iowa: The Iowa State Univ. Press, 1971. 191pp. Edges of boards lightly rubbed. Jacket shows wear at edges and folds. [Midwest]. Cloth. Very Good/Good Plus. 8vo - over 7¾" - 9¾" tall. Ames, Iowa: Iowa State University Press. CR 1971, 191 pages, black and white chapter headings, blue covers with pencil signature of previous owner inside, and author's initials in black on front cover, all very good condition. This book was written so her grandchildren would know the character and rugged way of life of their grandparents, Edwin and Sue Frear. He was a country doctor starting in 1882 in Sloan, Iowa. Cora went with her father as he made house calls and also worked in his office. She had many old letters and a diary that her father kept as a young man.. Stated first Edition. Hard Cover. IO: Iowa State, 1971. Hardcover. Very Good/Very Good. First edition. Very good or better in an about Very good dustwrapper. Dustwrapper rubbed with short tears and folds along top edge. Please Note: This book has been transferred to Between the Covers from another database and might not be described to our usual standards. Please inquire for more detailed condition information. Iowa: The Iowa State Univ, 1971. Hardcover. Good/Good. First edition. Good in good dustwrapper. Sticker peeled off of inside front cover. Corners bent. Edges of spine bumped. Dustwrapper price clipped. Dustwrapper has tape along edges. Dustwrapper slightly shelf rubbed. Spine lean. Please Note: This book has been transferred to Between the Covers from another database and might not be described to our usual standards. Please inquire for more detailed condition information. Iowa: Iowa State University Press, 1971. Stated 1st Edn Blue Binding w/blk lettering, 191 pgs. Clean Tight Copy, not remainder or lib. Intact DJ has minor shelf rub now in Mylar, Author's account of her father's work in 1882 as the country doctor in Iowa. Size: 8vo - over 7¾" - 9¾" tall. First Edition.. Hard Cover. As New/Very Good. The Iowa State University Press, Ames, IA, 1971. First ed.. Hardcover. Very Good. Op. Lib. stamp on ffep. Dj moderately worn: chipped at spine top and bottom, tiny tears around edges. Otherwise vg condition. 191 pp. Iowa State University Press, 1971. Bright Orange boards in PERFECT condition with black monogram CFH on front. Interior Pages are Clean and perfect except for first endpaper which has the right corner cut off. Owner's name. Dust jacket is blue with black and white photographs collaged over each other. D.J. has edgewear and chipping and small tears; good plus condition. FIRST EDITION 1971 STATED.. First Edition. Hard Cover. Fine. 8vo - over 7¾" - 9¾" tall. Ames, IA: Iowa State University Press, 1971. 1st Stated Ed. Hardbound. 8vo. 191 Pgs.. Nr Fine in Chipped DJ/Good. Buggies, Blizzards, and Babies by Cora Frear Hawkins. Published by Iowa State University Press, Ames, IA, 1971. 1st Stated Edition. Hardbound, Paper DJ. Size 8vo (up to 9-1/2'' tall). Condition: Nr Fine in Chipped DJ. 191 Pgs. ISBN 0813803950. LCCN 74-137091. This book is largely an account of the author's recollections of her father, Dr Edwin D Frear and his work as she accompanied him on his medical calls. Additional material obtained from her father's diary and other personal sources. Capturing a bit of old Americana, the author takes the reader back to the turn of the century, to the favorite old horse and buggy and the first automobiles and rural telephones. You will find yourself in a well-equipped doctor's office of the day, which may boast a dandy, new hand-operated generator for treating rheumatism. Or in the adjoining office of the author's dentist-uncle, you may view with some trepidation the S S White Vulcanize that often seems in danger of exploding. This thoughtful, informative account of the dramatic and humorous episodes in a pioneer doctor's life is delightful reading for all ages. Description text copyright 2006 www.BooksForComfort.com. Item ID 11608. Ames, IA: Iowa State University Press, 1971. 1st Stated Ed. Orig owners bookplate inside front cover. Slight edge & corner wear, overall content excellent. Hardbound. 8vo. 191 Pgs.. Nr Fine in Chipped & Taped DJ/Good. 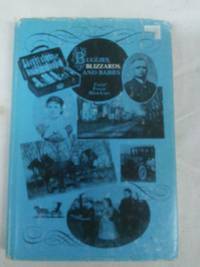 Buggies, Blizzards, and Babies by Cora Frear Hawkins. Published by Iowa State University Press, Ames, IA, 1971. 1st Stated Edition. Hardbound, Paper DJ. Size 8vo (up to 9-1/2'' tall). Condition: Nr Fine in Chipped & Taped DJ. Orig owners bookplate inside front cover. Slight edge & corner wear, overall content excellent. 191 Pgs. ISBN 0813803950. LCCN 74-137091. This book is largely an account of the author's recollections of her father, Dr Edwin D Frear and his work as she accompanied him on his medical calls. Additional material obtained from her father's diary and other personal sources. Capturing a bit of old Americana, the author takes the reader back to the turn of the century, to the favorite old horse and buggy and the first automobiles and rural telephones. You will find yourself in a well-equipped doctor's office of the day, which may boast a dandy, new hand-operated generator for treating rheumatism. Or in the adjoining office of the author's dentist-uncle, you may view with some trepidation the S S White Vulcanize that often seems in danger of exploding. This thoughtful, informative account of the dramatic and humorous episodes in a pioneer doctor's life is delightful reading for all ages. Description text copyright 2011 www.BooksForComfort.com. Item ID 25929. AMES, IOWA: IOWA STATE UNIV PRESS. G/G- DJ EDGEWORN, LIGHTLY SOILED, SMALL TEARS. Pages: 191. . 1971. 1ST. HARDCOVER.. DJ DARKENED AT REAR. . Condition: G/G- DJ EDGEWORN, LIGHTLY SOILED, SMALL TEARS. Pages: 191. Ames: Iowa State University Press, 1971. Book. Very Good. Hardcover. First Edition. 191 pages, photos, minor rbbing to jacket. The author's father was a country doctor in Iowa in the late 1800's. She often accompained him on his calls..
Ames, IA: The Iowa State University Press, 1971 Book. Good. Hardcover. 8vo - over 7¾" - 9¾" tall. Good/good. 191 pages. Robin egg blue cloth cover with black text on front and spine. Minor soiling to head edge and shelf wear to spine. Ex-libris plate on paste down end paper but I don't think this is a library copy. Blue pictorial cover with blue and white text on front and spine. Minor chips and tears to head and tail of spine of the dust jacket. Book has minor musty smell. Cora's tale of assisting her doctor father on his calls and "the dramatic and humorous episodes in a pioneer doctor's life"..
Ames, IA: The Iowa State University Press, 1971. Stated First Edition. Hard Cover. Fine/Fine. Very clean blue boards with black lettering on cover and spine. No bumping or wear. Binding is tight & crisp, pages and edges are clean and bright. Very small P/O label at inside edge of front free endpaper. Illustrated with old photographs. CLean bright dustjacket has not been price clipped, is unchipped and enclosed in new archival quality mylar cover. Iowa State University Press, Ames, IA, First Edition, 1971dj The dust jacket is in fair-good condition and the book is in near mint condition..
Iowa State Univ. Press. 1971. First Edition. Hardcover. Very good, name lable inside cover, in good+ chipped dustjacket. ; 191pp. Turn of the century Iowa doctor's life. . The Iowa State Univ. Press, 1971. Hardcover. Biography; Dr. Edwin D. Frear set out in 1892 to brave the hardships, struggles, and challenges that characterized the life and practice of the country doctor. The author tells this story about her accompanying her father on his medical calls in northwest Iowa. (191 Pgs.) DJ has a few nicks and small tears. DJ VG/BOOK NEAR VVG. Ames: Iowa State Univ. Press. Hardcover. 1971. 1st Edition. 8vo 191pp . Fine in Very Good DJ. B&W Illustrations. Told by his daughter, this is the story of Dr. Edwin D. Frear who began a medical practice in rural northwest Iowa in 1882 . Iowa State University Press, 1971. s5 chips tears to dust jacket. First Edition. Hard Cover. Very Good/Good-.